Short Product Description: These are the best luxury conditioner bars you will ever try. All formulas (Dry to Damaged, Normal to Oily & Wavy to Curly) have been tested by many with raving reviews! These will help with hair types caused by damage due to chemicals, controls oily hair, controls frizz, detangles and adds moisture back into the hair that has been lost. Revitalize, restore and strengthen your hair! We offer 3 different hair type formulas. Conditioner bars are the new rage. They are a concentrated hair conditioner with the best top of the line butters and oils packed into a convenient solid bar. Our conditioner bars are nourishing, repairing, moisturizing and de-tangling. You can use this conditioner bar as a night treatment, leave in conditioner or use as a regular conditioner as you normally would. 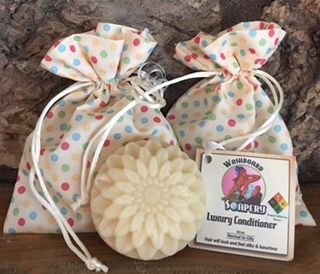 Our conditioner bars will pair perfectly with one of our syndet shampoo bars or our regular shampoo bars. Perfect for traveling too with no accidental mess! Move over liquid, hello bars!